Partygoers rocked The Belmont in Austin, TX until the wee hours. 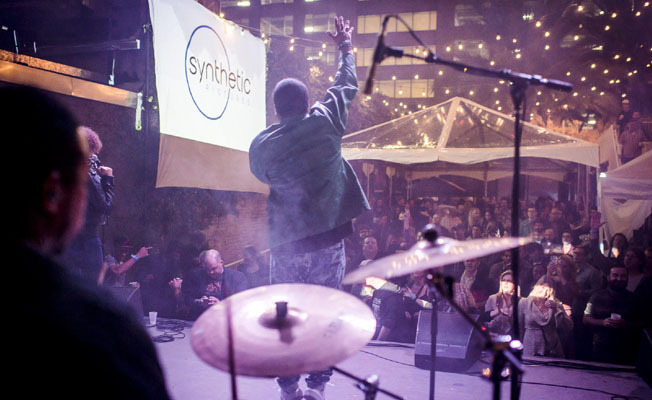 Over 800 ad agency creative and production people, along with members of the production and post production community around the country, kicked off SXSW right at the SXKO bash, hosted by Synthetic, Yessian, Apache Digital, Beast and Ntropic. Rapper Lyrics Born at the SXKO party. Over 800 ad agency creative and production people, along with members of the production and post production community around the country, kicked off SXSW right at the SXKO bash, hosted by Synthetic, Yessian, Apache Digital, Beast and Ntropic. Over 800 ad agency creative and production people, along with members of the production and post production community around the country, kicked off SXSW right at the SXKO bash, hosted by Synthetic, Yessian, Apache Digital, Beast and Ntropic. It’s hard to compete with the star power of President Barack Obama, but a quintet of advertising’s top production and post production players did just that as they marked the start of the 2016 SXSW Festival with yet another rockin’ party. 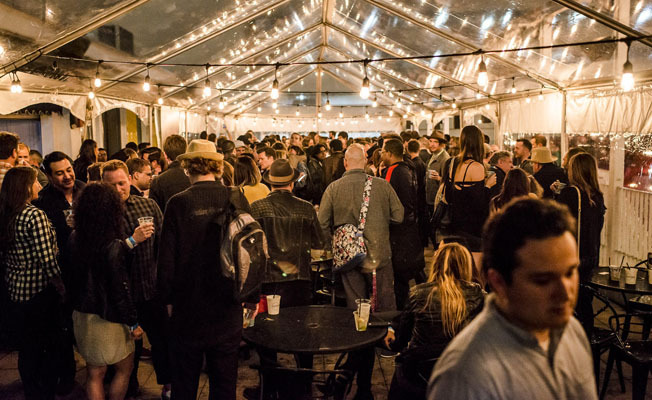 As ad industry professionals from around the country descended on Austin for five days of music, media, panels and partying, many made their way around Secret Service SUVs to The Belmont, scene of this year’s ‘South By Kick Off’ party, also known as #SXKO. All told more than 800 partygoers made the scene on Friday night, March 11, where the guest list included creative and production people from BBDO, DDB London, Digitas, Doner, Droga5, GSD&M, JWT, 72andSunny, Team Detroit, Publicis Frankfurt, Jung von Matt and Wieden + Kennedy/Amsterdam, as well as from other production companies and post houses. This year’s edition of #SXKO was once again hosted by Synthetic Pictures (http://syntheticpictures.com/home), the L.A., New York and Austin-based production house, and Yessian Music (https://www.yessian.com/), the Detroit, New York, L.A. and Hamburg, Germany-based original music and sound studio, who are the anchor hosts. Also co-hosting for the second year in a row was Apache Digital (http://www.apache.tv/), the L.A.-based color grading boutique. They were joined by Ntropic (www.ntropic.com), the L.A. and New York-based visual effects, post production and design studio, and the Austin and LA offices of Beast (www.beast.tv), the national creative editorial and post production company. It wouldn’t be SXSW if there wasn’t great music, and this year the #SXKO hosts lined up some impressive artists for the event. Appearing at The Belmont, a downtown party space known for hosting hip-hop, rock and EDM shows, were Lyrics Born, (a.k.a. the Tsutomo “Tom” Shimura), the Japanese-American rapper and producer; the Brooklyn-based Oberhofer, led by musician and composer Brad Oberhofer; and the Atlanta based indie rock group Gringo Star. After the bands wrapped up, the party was taken over by DJ Cutso, the San Jose-based mix master. Michael Yessian, Partner/Head of Production at Yessian Music, says SXSW is the perfect venue for companies like his and the other co-hosts to hold such a celebration. “There are so many new ideas and new creative influences to be found here, and that’s what agency creatives and producers look to companies like ours to provide,” he notes. While the artists performed at The Belmont, multiple projection screens set up around the venue beamed images, video clips and live social media posts throughout the night, with prizes handed out for the most outrageous photos and videos posted to the #SXKO hashtag. Also co-sponsoring #SXKO were the Austin-based Deep Eddy Vodka™ (www.deepeddyvodka.com), a maker of a line of small-batch artisanal flavored vodkas; Bristow Gin (www.bristowgin.com), a handcrafted spirit from Cathead Distillery; SHOOT (www.shootonline.com), the production news web site and magazine; and Guitar Center, the nationally-known instrument and audio retailer. To screen a video from the event, click here: https://vimeo.com/159136559. To check out photos from the event, click here: https://www.flickr.com/photos/139294093@N04/sets/72157663596245194.